This large First Prize Bull Agricultural award trophy was modeled by Isidore Bonheur and cast in bronze by the Christofle Silver Co. of Paris. The bronze Bull is silver plated with an extremely thick layer of silver, yet you can see all the hair details on the Bull, it is one of the most detailed Bonheur bronzes that we have seen over the years. This sculpture is very unusual in that it has Isidore Bonheur's signature on the base. Much of the work that Bonheur was contracted for at Christofle is unsigned. 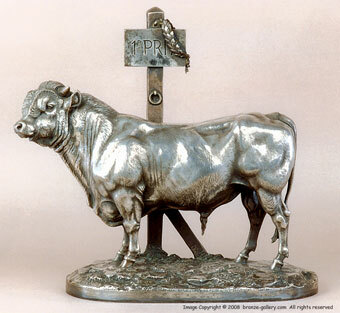 There is no inscription as to who was awarded this very fine First Prize Bull sculpture. It is a very detailed portrait of a winning Bull in all his glory, and this model rarely comes on the market.